The Desert Solstice 24 hour race is an elite level invitational event that also includes a 100 mile race. Taking place at Central High School Track Phoenix, AZ, this years events had 22 starters at 8am December 14th. Billed as an opportunity to set records and to qualify for the US 24 hour team the race has seen numerous records set. 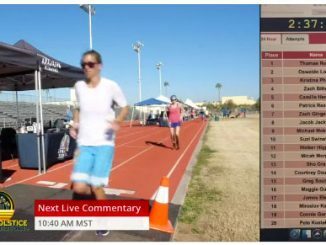 This year saw Zach Bitter set a new American 100 Mile Record in a scorching 11:47:21 beating Yiannis Kouros’s 12 hour World record on the way. 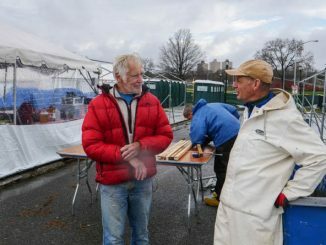 With almost 21½ hours on the clock there are three runners on the track – Olivier Leblond, 140 miles, Ed Ettinghausen, 132 miles and Roy Pirrung, 100 miles .